Think of America. The beautiful. The terrible. Land of liberty, land of slavery. Stuff of dreams oof all kinds. 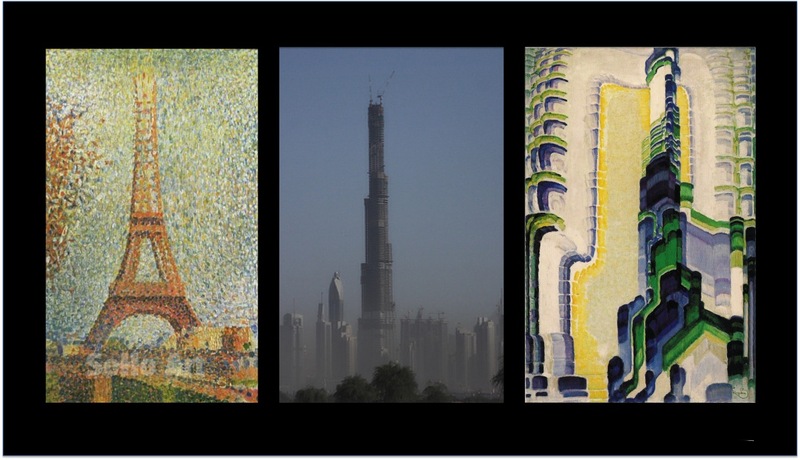 This post is about three works of art that epitomise America (to us anyway): Plenty. Power. Paradox. Plenty came first. The century went by the number 19. The world flocked to America, to flog or be flogged. There was too much of everything. Too much liberty. Too much cruelty. Too much land. Too much blood spilled over it. And where Europe had always found itself not having enough, America became the land of inexhaustible plenty. The new people came and tamed the land, tamed the rivers, tamed the mountains, tamed the sea, tamed the seasons. And soon the land teemed with everything they needed. No painting summarises this American story better than Thomas Hart Benton’s Achelous & Hercules. The self-appointed new masters of the land discipline their dominion. On the sidelines, slaves and new immigrants watch and work. In the background, machines are already taking over, and dark clouds gather unnoticed. Everywhere you look, there is plenty lying fallow. From time to time, the world trembles. Tectonic plates shift. Age-old poles melt down. Venerated truths crumble. When change is everywhere, fear is never far away. Today’s association is about depictions of change. And by that we mean change as a threat, as upheaval, not change as redemption. We’re talking about those most tumultuous of times, the longest, and the coldest, hour of pre-dawn still-night that comes before every first, golden, red-hot light of a virgin-new day. We mean that sinking feeling when all the sinews, truths and ties that kept the world of yesteryear together fizzle and break and men are left scanning dark and naked horizons, hoping for first light yet seeing nothing but emptiness. Century-defining, gravity-defying change. Revolution. Collapse. Birth. Death. Rebirth. This post is really two pairs of associations, and an afterthought. The first pair (above) shows what change can mean to the individuals who are left struggling in the midst of it. We see two solitary figures surrounded by emptiness: Caspar David Friedrich’s Monk by the Sea and Jia Ai Li’s Seeker of Hope. It’s striking that these two painting were made centuries and continents apart, and yet they basically show the same scene: a clueless man pondering an inhospitable and bleak world that clearly has no need for him. European romanticist painters, unnerved by the havoc wreaked by their continent’s industrial revolution on society, nature and political structures, wondered where we – humans – fit in in this brave new world with its new order. They asked how man could dare to take on nature. It turns out, judging by Jia Ai Li’s paintings, that very much the same thoughts occupy the painters that depict China’s current industrial revolution. The second pair of paintings shows a bit more context: The gargantuan standard-bearers of the new age – furnaces then and space-travel now – are juxtaposed with the unfortunate people who are being left behind, quite literally in tatters. Have the world has moved on to new shores, and the other half has been left behind. The new world holds both the promise of paradise – plenty, power, the pursuit of wild dreams – and huge destructive potential – the red heat and black dust and smoke of the furnaces, the exhaust clouds of the rocket that could be carrying hellfire in the form of a nuclear warhead (a recurring theme in Jia Ai Li’s art). The old world, even as it is falling apart, projects an aura of social warmth and humaneness that the new world is utterly lacking. At the same time, everything that is old is undeniably broken or breaking, unfit to see the new day. And above it all lingers the question that must not be said out loud lest is shatters everyone’s confidence: What’s the point? 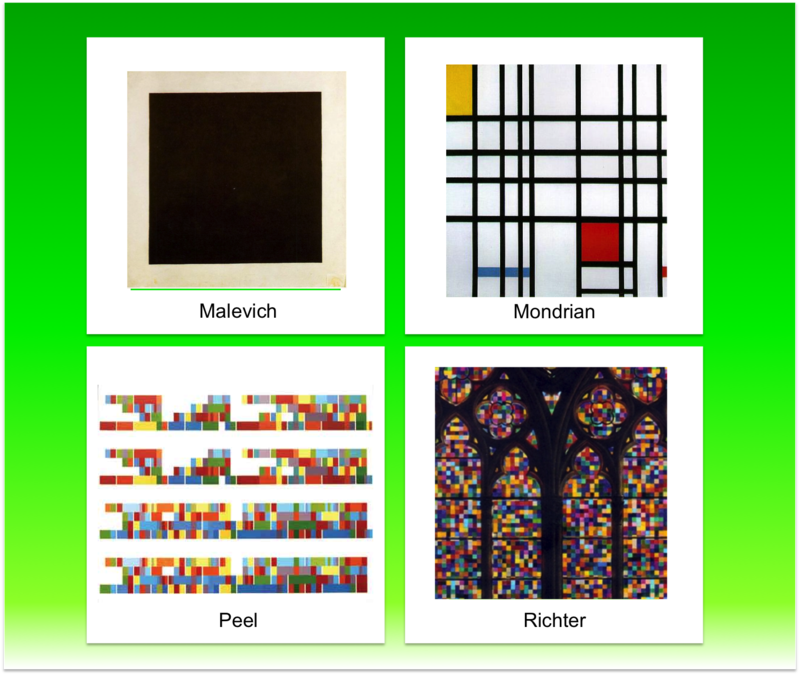 All the paintings are set at dawn, or at dusk. Because while you live through change, you never know whether it’s change for the better, or for the worse. You don’t know if the sun is coming up, or going down (and staying down). 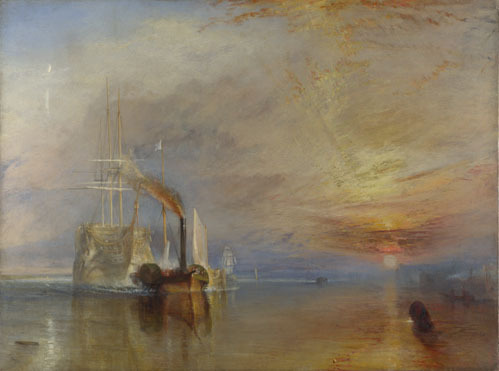 And here’s a final afterthought: Turner’s Temeraire shows that glorious day when the new light has conquered all that is old. 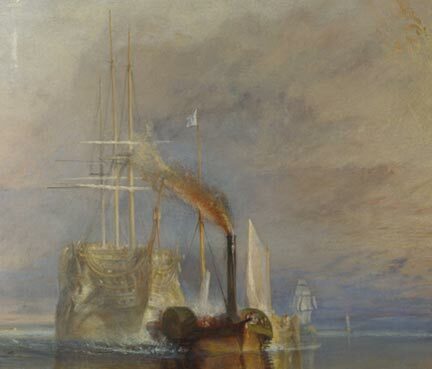 The small, modern steamboat is taking the huge old Temeraire to its eternal resting place. The old world is majestic but it is powerless. It can no longer resist. It no longer holds any promise. The new world is infinitely greater and needs nothing the old world has to offer. Or does it? Because it turns out, as European and American history shows us, that the darker and colder the pre-dawn hours are, the greater the hubris that follows first light will be. Change is 50% destruction and 50% madness. And that’s what this art association is about. We felt like trying something new. Because change is good. So we made a video. We called it the ArtBlogLog. Each episode shows the best of the best from our tireless and wonderful journeys through the fantastic, mesmerizing, orgasmic, all-encompassing, mind-blowing, horizon-expanding, dazzling world of artblogs, here are our favourite pieces from artblogs around the world. To amaze you and to promote the blogs. Credits are below so you can go and visit them – they’re all well worth it. Oh yes, and we decided to start on the theme of women. Because really, there would be no art, and no point to art and life, without them. Since everyone’s into memes right now, here’s our art meme. Six pieces about men and their gods, gods and their men. All of them at once terrible and beautiful, all causing a stir in heart and mind. Like men, like the(ir) gods. Who’s who, who was made by whom, who was there first? This is what this association addresses. *Correction: An earlier version mistakenly claimed that da Vinci had painted the Sistine Chapel’s ceiling when in fact it was Michelangelo’s work. Thanks to artmoscow for spotting the error. We’ve stared death in the hollow icy eye for hours now, and this art association is about just that: three killing machines, tamed by artists and put in a gallery for us to come closer and wonder: what if, what if, what if I died, like, right now? Us humans, we’re fragile. Here today, gone tomorrow. But art is there forever. Its beauty is, and the emotions we feel forever permeate the depths of the universe, the reell of space warped around time. What we find so special about this trio is that people do die like this, and yet we think it could never happen to us. The artworks therefore allow us to access a world that doesn’t exist, a world in which we’re the victims, and about to meet a very banal and violent death. 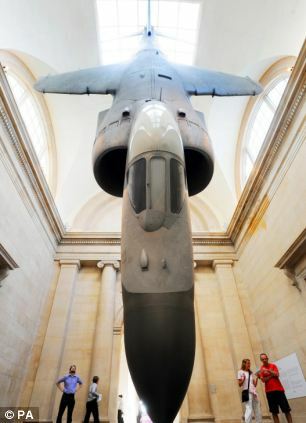 Be it with the twisted angles of Skreber’s car wreck at the Saatchi Gallery, in front of Hirst’s shark at Tate Modern or underneath the Sword of Damokles-esque Sea Harrier that’s found its eternal resting place at Tate Britain. We are trapped by the sheer near-ness of the what-if, and our own perish-ableness. That could have been me had never been more true. We don’t much like Hirst, on account of his thirst for money and lame fame. We don’t like the military either, nor cars, cause they wreck this planet. But the emotions, oh the sweet emotions, the beads of fear running down our spine. We love that. That’s what modern art is about. Sheer unbridle raw emotions. Shout it out. We’re finally free to let them run out. We can be plain, open, honest about these things. We don’t need to hide between signs and symbols and more. We need shrill thrills to feel we’re alive in the numb dumb age. The shrill thrill of the killing machine, unleashed on us. How modern. How amazing.